Airtel Nigeria are on the race to become Nigeria's number 1 network of choice when it comes to affordable data plans. You can also access about 30 free site whether you have data or not on Airtel free basics program. I think the right time to move to the Smartphone network is now. I know what we all want is a true unlimited data subscription without data cap and also one that is affordable. Believe me, we are getting there. Airtel has rolled out a new plan that will allow its subscribers enjoy 2GB and 5GB for N200 and N500 respectively. Please note that this is not a cheat but a genuine plan from Airtel and it works on all device. How to subscribe to this Airtel Plan. • Follow the on screen instructions and you are good to go. • N200 for 2GB has a 14 day duration. 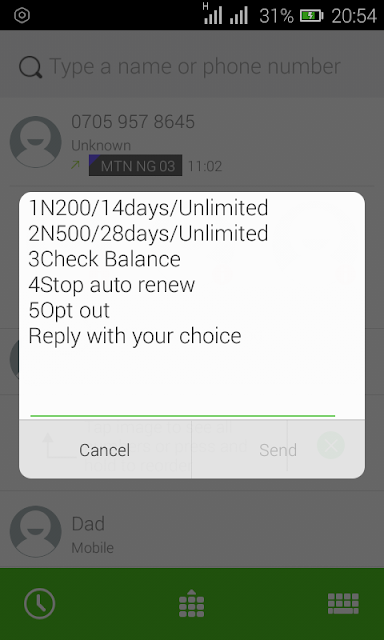 • N500 for 5GB has a 28 day duration. There is only one limitation which is, it only works with 2g network. Its obvious, this is their way of preventing subscribers of the plan from large data consumption.